Let’s create the view. first. But I’m not going to show it in the post. Just two text boxes for username and password, two buttons for login and register. 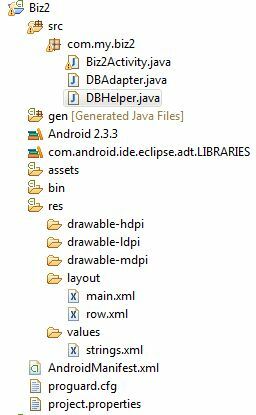 Today we are going to build a simple database application in Android. First see the project resources screenshot indicated below. We need a DBHelper class that inherits from SQLiteOpenHelper super class. 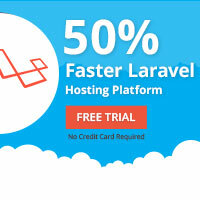 This allows to create database, upgrade database, get a writable database, get a readable database and many more. DBAdapter class consists of several user-defined wrapper methods to handle database operations like add,update,delete,fetch data …etc. Inside these methods we call built-in methods in SQLiteDatabase class to accomplish our tasks. The Biz2Activity class is bind to main.xml and it creates the only GUI interface in the application. The interface has a ListView to display business items as a list. User can add, update or delete a business using the options menu. Android DatePicker tool is used to get the date. 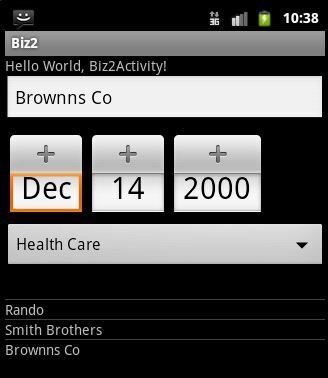 Business categories are listed using Android Spinner which uses an ArrayAdapter to get and display data. The data comes from a String array defined in Strings.xml in Resources folder.